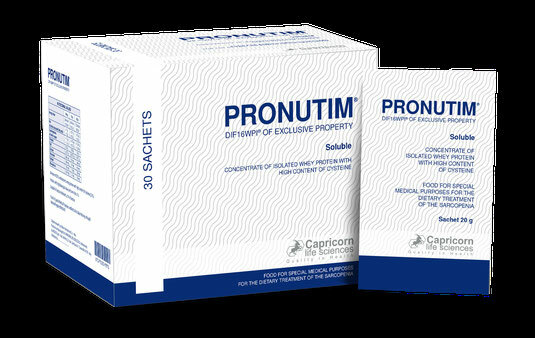 PRONUTIM CF - De website van capricornlifesciences! PRONUTIM CF is a food supplement which contains exclusive Whey Protein Isolate produced by microfiltration and spray drying process, with the addition of high amounts of cysteine and L-Arginine and the addition of MCT - Medium Chain Triglycerides for the supportive care of Cystic Fybrosis. PRONITUM CF takes care of the most common symptoms from which CF patients are suffering: Oxidative Stress (deficit of GSH), inflammation/chronic infection and malnutrition (optimal energy value is 120-150% of the recommended calories for the same age/gender).